Immersive environments such as 3-D virtual worlds have shown great potential for learning since they have many features that distinguish them from other learning systems. They support explaining difficult phenomena by visualising objects and their relationships. Additionally, they enable collaborative learning by connecting students in real-time and increase engagement and exploration between them. However, assessing learning outcomes in these environments involves many challenges such as dynamically capturing and analysing the actions of users and translating these actions into learning evidence. This paper focusses on significant aspects of the learning process: observation and assessment. It presents a virtual observation model that maps observing learners in classrooms with observing and assessing students in 3-D virtual environments. In addition, it demonstrates the implementation of the observation model and provides examples of its application. 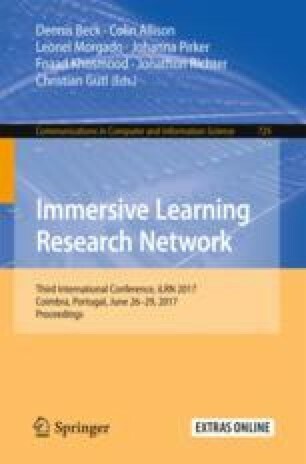 In general, the paper aims to enhance the learning affordances of the 3-D virtual worlds by recording all in-world learning evidence and visualising students’ assessments to improve learning.